I’m perpetually hesitant to call posts of this nature “guides,” because I don’t want to sound like I’m telling you what to do, or that it must be done in same manner I did it. Instead, my goal with this post is to spark your interest in a place and inspire you to see it for yourself. I will share with you what I experienced, but in the end, the choice and opinion is yours. 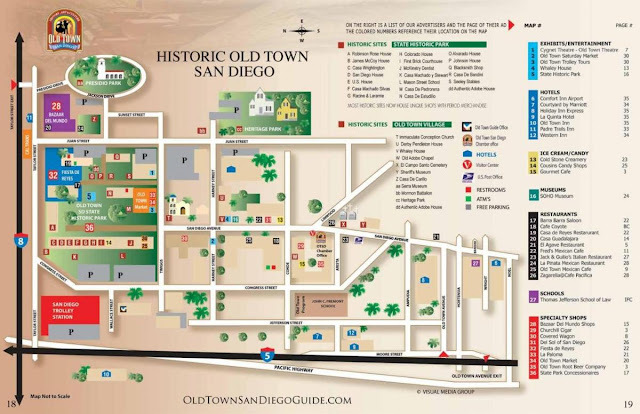 With all of that said, exploring Old Town San Diego was like stepping into a time capsule. It is considered the birthplace of California, with the first settlement created in 1769 with merely a mission and a fort. After strolling along the modern downtown city and watching the seals, a visit to this historic site completes the picture. We bought souvenirs at the Bazaar Del Mundo. Take in a free tour at the Mormon Battalion. Then, go to the nearby cemetery. The stories that come from this site stay with you. We also walked around the State Historic Park and the Cosmopolitan Hotel, which is another option for your stay. For more information, visit the Old Town San Diego Guide. Great post! The photos are really awesome! Looking for Smoky Mountains family vacation planner website. I will be glad if you can help me with your advice! HI again, Alex - at this time, I'm not sure I can be a resource for you in this regard. If you find something, will you share it in the comments too? I've never been, and would love to hear more about this!